For centuries humans have interacted with their physical world and their own bodies. Skin care methods and body detox methods have stood the test of time for a good reason. There were many early methods for detoxification, among multi cultures – from India and Asia to the United States – including everything from dry brush massage, to cupping, to counter-irritation. What’s more, an internal detox, or colonic irrigation is actually mentioned in the bible. Dating back to ancient Egyptian times, skin detoxification and beauty rituals included a number of primitive methods. One popular ancient organic skin care detox method was the use of sea salt from The Dead Sea. Our Egyptian ancestors believed that toxins formed in the body because of decomposition within the intestines, which ultimately resulted in a fever. One ancient method was known as “counter-irritation” which was produced by the direct application of a hot instrument or a cautery that was manufactured in a variety of shapes. Basically, drainage was implemented to cause a chronic inflammatory reaction which resulted in the form of a bister or running sore which could be maintained for a long period of time. This way, the humors (poisons) could be continuously released from the body. Counter-irritation was often used in the treatment of paralysis and asthma. The blister was commonly produced by applying a blistering agent such as a poultice of cantharides, and it was then left in place until a blister formed. Boiling liquids — oil, honey, wax and syrup were often used for cauterization. The doctors would often apply the cautery until they heard sizzling along with a noxious smell and shrived skin. Dating back to ancient Egyptian times, skin detoxification and beauty rituals included a number of primitive methods. One popular ancient organic skin care detox method was the use of sea salt from The Dead Sea, which was often used by Cleopatra in her bath to combat skin problems including psoriasis or eczema. Cupping is another body detox technique that has been practiced in China for many thousands of years. Believed to help free up blockages of energy pathways in the body, cupping involves placing heated glass cups onto the skin at key pressure points, causing suction which stimulates blood circulation. Dry skin brushing – brushing the skin with a dry brush – has been used for many centuries in Europe for. internal and external toxin elimination. It aids in unclogging pores that have become clogged from makeup, toxins in the air or from food. Dry brushing helps get rid of the dead skin cells with toxins, and it also helps increase circulation. Throughout history in most societies humans have practiced massage to relieve muscle tension and help eliminate waste matter from the muscles, as well as to assist in keeping the system regular. Recently – during the last century – massage has brought forth many new techniques to help cleanse the human body. Today skin detox methods are much more sophisticated including products that have been formulated especially for the purpose of detoxing the body. Herbalix Restoratives (http://www.herbalix.com) has been successfully marketing its Cleansing Detox Deodorant – a pure and organic Nighttime Cleansing Detox Deodorant is designed to cleanse aluminum, unwanted debris and impurities from the body. Our bodies sweat for a reason, and sweating is good, if not necessary. Sweat means that your body is operating efficiently and releasing toxins from your body. Our skin is the largest organ in our bodies. We must keep it functioning properly. Unfortunately traditional antiperspirants and deodorants simply plug up your sweat glands using aluminum and other ingredients like parabens that can do more harm than good. The Nicholas School of the Environment at Duke University reminds us that antiperspirants are a drug as they are classified as such by the FDA. If you have used regular deodorant and would like to make the switch to organic deodorant, first use Herbalix Detox Deodorant to help rid your body of toxins like aluminum and petroleum. With a blend of sea vegetables, olive leaf, and coriander, it smells lovely while helping to purify your system. 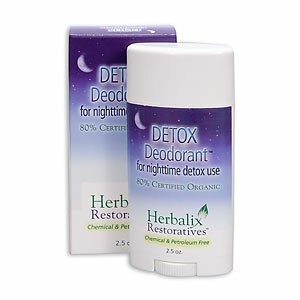 Use the non-aluminum nighttime Detox Deodorant for thirty consecutive nights. Then a maintenance program will work. Believe it or not, you wont smell any more after using it. Therefore you barely need deodorants at all, but just because we are all so accustomed to them, try organic Herbalix Daytime Deodorants — it comes in no fragrance for those who are sensitive. The Herbalix Nighttime Cleansing Detox Deodorant is the latest rage among people seeking organic deodorants. If you look online, you will see that folks everywhere have started asking questions — on Yahoo Answers, Yahoo, Google and Facebook, and on and on in social media sites. People are reading about the dangers of aluminum in our bodies, and are now afraid to put antiperspirants and deodorants under their arms. “Aluminum is a neurotoxin which affects diverse metabolic reactions… Aluminum chlorohydrate is the “bad” ingredient used in many antiperspirants,” according to Pub Med.gov, US National Library of Medicine, National Institutes of Health. According to The Chemical Book, aluminum is classified as follows: “Strong evidence of human neurotoxicity” Health Hazard: “TOXIC; inhalation, ingestion or skin contact with material may cause severe injury or death. And, many people don’t realize that their skin is not a barrier to aluminum. What you put on your skin matters because it absorbs. Now more and more consumers believe that we now need to seriously investigate the absorption of aluminum on the skin – especially since it is already in so many personal care and cosmetic products. Research continues regarding cleansing aluminum out of the body towards better health, because it can affect the lymphatic and endocrine systems. It’s just another indicator of why you should think about using only aluminum-free deodorants from now on. And look for the Herbalix Nighttime Detox Deodorant used for 30 nights to cleanse aluminum from the underarms. Can Detoxing Underarms Cut Down on Abdominal Fat? The proportion of fat to body weight usually increases as we age. Especially women after menopause around 50 years of age. The extra pounds pile on around the midsection, causing that dreaded middle age spread also known as muffin top in women and beer bellies in men. This dreaded abdominal fat, is in actuality, visceral fat and it hides deep in the abdominal cavity of your body near the organs, which is why it can be a key component in many health problems. The other kind of fat that you can grab onto is known as subcutaneous fat. Visceral fat is known to cause metabolic disturbances and increased risk for type 2 diabetes and cardiovascular disease. Some believe it is also associated with the need for gallbladder surgery and even breast cancer, which brings to mind how our bodies deal with toxins. For instance, did you know that many of the branded deodorants today on the market have aluminum, and other ingredients known to clog the sweat ducts underneath your arms? One of the best-selling products is the Herbalix Detox Deodorant, which helps detox aluminum from the body through use nightly. More and more consumers are switching to non-aluminum deodorant today. Check the labels to see if your deodorant products contain any type of aluminum, alum, petroleum or propylene glycol. These ingredients can lead to the buildup of chemicals under your arms, resulting in irritation or worse. Antiperspirants may leave alum salts in the underarm and some believe it can cause undetermined DNA damage. Just remember that the detox deodorant Herbalix makes can help clean out your lymph glands and tissues to rid the body of aluminum. Mineral salts are in the water we drink, and they are also in most of the foods we eat. Miceral salts are actually in the air we breathe as well. Alum, in its natural form, is the third most abundant element that has been found in nature on earth. Alum is a basic building block, and its has been part of our environment since the beginning. However, there are some controversial and potentially harmful aluminums that are found in most many commercial antiperspirants For instance, aluminum chlorohydrate, a neurotoxin that alters the function of the blood-brain barrier, and also aluminum zirconium. This is a chemical that is used in most consumer deodorants and antiperspirants, and it can cause allergic reactions in some people. And, crystal deodorants are made of a natural mineral salt that has been harvested directly from the earth. It is also known as alum. Crystal deodorants help prevent body odor by creating a thin barrier above the skin so that bacteria cannot form, and it is the bacteria that cause odor. Crystal deodorants are made from natural mineral salts (alum). Even though crystal deodorants do not use aluminum chlorohydrate, aluminum zirconium, or any other harmful aluminum, some people believe them to be dangerous to the skin. Deodorants and antiperspirants are the most common products used to control body odor in recent centuries, as deodorants mask, suppress or prevent body odor. But they don’t reduce the amount of perspiration the body produces. On the other hand, antiperspirants are made from chemicals made to inhibit the activity of sweat glands. Even as deodorants are considered to be a cosmetic product (only controlling odors), antiperspirants are considered drugs. Why? Because they affect the physiology of the body, and the Food and Drug Administration (FDA) controls any active ingredients that are used in antiperspirants due to this drug classification. As of late there have been many claims that crystal deodorants, being promoted as all-natural deodorant alternatives to chemically laden commercial deodorants, are composed of mineral salts, which form a topical layer on the skin. In reality, many of the deodorants on the market today simply mask odor with fragrance. Many people believe that salts in antiperspirants form temporary plugs in some of the sweat gland openings, and it is this that inhibits the secretion of moisture, or sweat. Antiperspirants use the main ingredient which is an aluminum-based compound such as Aluminum Chlorohydrate, Aluminum Chloride, Tricholorohydrex Glycine, Aluminum Zirconium, or Aluminum Hydroxybromide orThese are all considered unhealthy ingredients. It is for these reasons that Herbalix reasearched, tested and developed the non-aluminum deodorant known as Herbalix Nighttime Detox Cream. You are currently browsing the archives for the Natural Deodorant category.